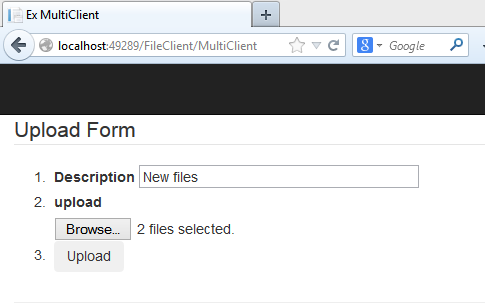 This article demonstrates file uploads using Web API 2. The examples use the MultipartFormDataStreamProvider class. The controller implementation saves the files in memory first, so for large files or with a lot of HTTP traffic, this is not a good solution. Links to other examples are also included at the bottom of this post. The Web API controller implements the server method for file upload. This saves the content to a provider location and creates a new file name with no endings. The file(s) information is collected from the form data and the file headers. The headers are not always set depending on the client. This server method works for both single and multiple file uploads. DownloadLink = "TODO, will implement when file is persisited"
The server method uses a ValidateMimeMultipartContentFilter attribute to check if the correct MIME type is sent. This can then be used for all uploads methods. If the upload is successful, a FileResult object is sent back to the client. This object in the demo contains more information than is required. This could be used to store the files in a database and a link with the file name could be returned to the client instead. This is the html example used for a single file upload. This is the html file used for a multiple file upload. It is important that the name is supplied in the multiple input control, otherwise the server cannot separate the files. 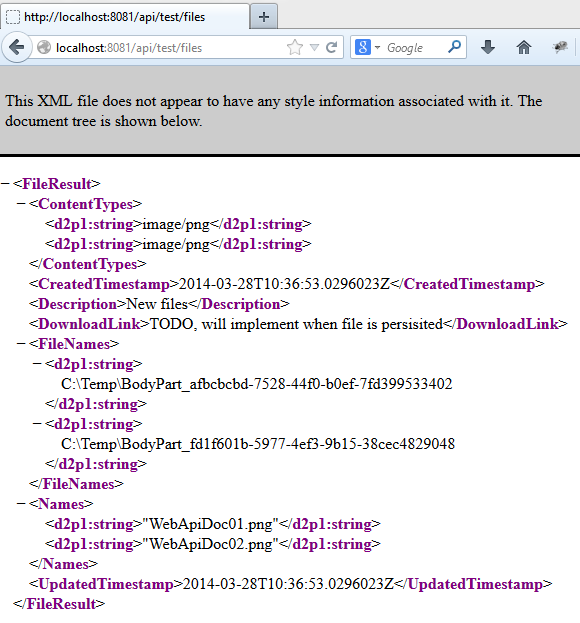 And the reults of the file upload in XML format. The example saves the requests in memory. It would be better if this was not required for performance. The files usually need to be saved to a database. This works easy, if using SQL 2012 as the files can just be saved like above using FileTables. But if using SQLite or something else, the files need to be read again and saved to the database, it would be better if the files were streamed directly to the database and not first to a provider. How do you keep the file extension and name ? Hi Djens, thanks for your coment. How does it work when uploading multiple files? Under “What’s Missing” you say.. “The example saves the requests in memory.” meaning what? You are not saving in memory nor extracting the file uploads into memory. You are saving any uploads into it’s own file. Is there any way to NOT save into a file, and just work in-memory only server-side (before writing to a database) ?